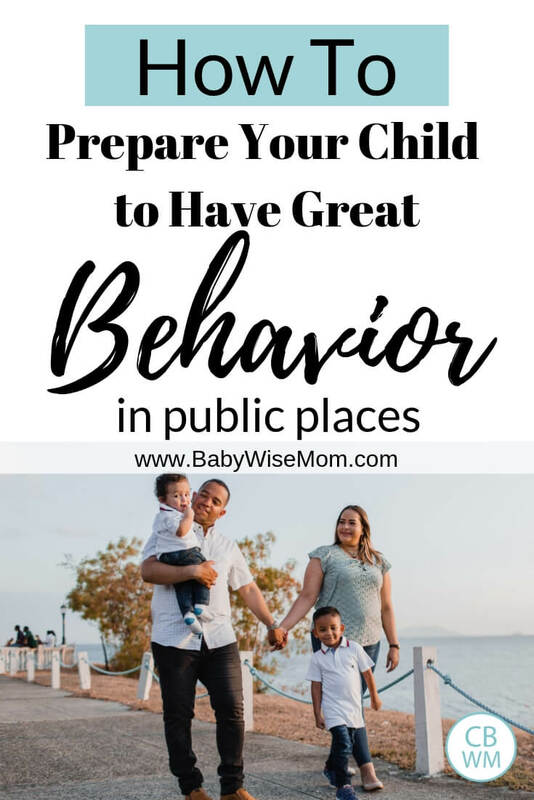 How to Prepare Your Child for Great Behavior in Public. How to teach your children to be well-behaved when you go out to dinner, to church, or even the park. Going out in public can sometimes seem like a scary adventure. Children are unpredictable, and you never know what they are going to do while you are out in the public eye. I like to expect the same level of good behavior in public as I do at home; in fact, I probably expect better behavior than at home in many cases in order to show respect to others who are out in public. Before we get into the “how” of teaching children to behave in public, let us all acknowledge that most people out there understand that children are children. It is my hope that most people are understanding of the way children are and don’t expect them to be perfect little robots. Even the best behaved children have melt-downs. I hope when people see children misbehaving in public, they are sympathetic and kind to parents who are trying to correct that behavior. I know that not all people are. You have your population who has yet to have children of their own and yet know the correct way to parent. There are some also grandparents out there who seem to have forgotten what having young children was like. There are other people who are just plain impatient and judgemental. You can’t do anything about them. Just focus on having your child behave the best you know he can and ignore the looks that may come from others. Do not let them shake you or make you second-guess yourself. So the question is, what expectations can you have in public, and how do you reach them? Like I said earlier, I really have the same expectations at home as I do in public. I do adjust for context. If the child is up past bedtime, I know it isn’t fair to expect him to be as good as he would otherwise. If we are having dinner an hour late, I have to realize the same thing. That doesn’t mean I allow inappropriate behavior, it just means I have more grace in dealing with the situation. “Right” expectations are dependent on you. Each culture has different expectations. Each public location has its own “culture” and proper behavior. A sit-down restaurant is going to require a lot more from your child than McDonald’s. You need to decide what proper expectations are. Now on to how to reach those expectations you have set up for public behavior. 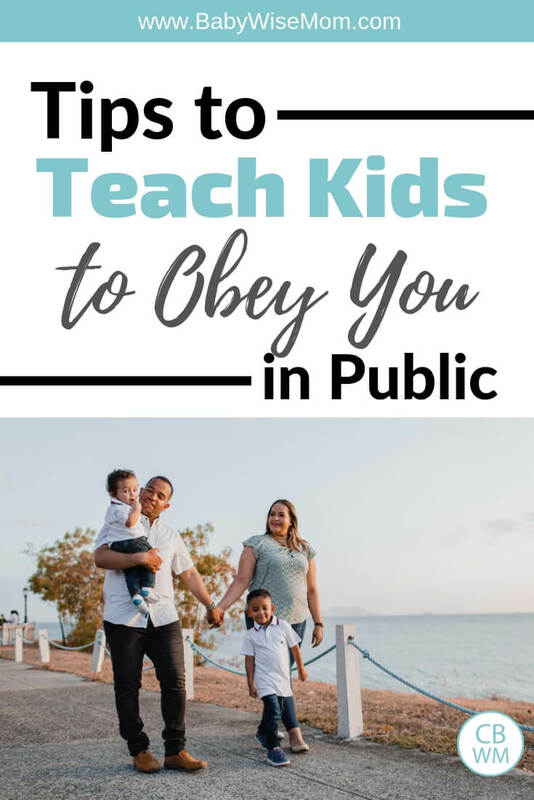 Whether you are going out to eat, going to the park, headed to the library, attending church, or taking off on a plane with your kids, you will want them to behave well while out. You want them to be respectful to others who are also there and you want them to listen to you when instructions are given. It starts at home. You absolutely cannot expect your child to obey you better in public than he does at home. Public brings overtiredness, boredom, overstimulation, hunger, excitement, etc. If your child doesn’t obey you at home, he isn’t going to in public. If your child is old enough, sit them down and talk about the expectations you have for your trip. Children are not born knowing how to behave when they go out to eat. They are not born knowing that in a library, we whisper–they aren’t even born knowing how to whisper. Tell your child what isn’t allowed, and most of all tell them how to act. Do this before you go to the new place. Show them and demonstrate. Demonstrate a whisper and have them try it out. This is Training in Times of Non-Conflict. The library is not the place to teach about whispering. Home is the place to teach. The library is the place to remind your child what they have already learned. Again, it starts at home. Avoid taking your child out when it is naptime. If you are going to be eating dinner late, offer a light snack so they won’t be too hungry to obey. Set your child up for success so the time spent out in public can be more enjoyable for everyone. If you are going out to dinner, don’t expect your young child to just sit there quietly the entire time with nothing to do. Help him out. If he likes to color, bring some crayons and paper. Brayden wasn’t a color-er as a young toddler, so I would bring a car for him to drive around from his seat. He was expected to be quiet about it, but he had it. Also, don’t break these fun items out as soon as you get there. Wait until you see the need, and only pull out one at a time. At restaurants, I like to delay my children from eating as long as possible. Children get full quickly and don’t eat much. At a restaurant, you spend a lot more time sitting at the table than you do at home. If they eat right away, they won’t be hungry by the time the main meal arrives. When going out to eat, you might want to bring along some food you know your child likes. This is especially true for the baby who eats baby food and some finger foods. Bring some finger foods for the baby to eat while everyone else eats if you aren’t sure the restaurant will have something your baby can eat there. I don’t let my kids get out of their seats at a restaurant. If you do it once, they will want to do it every time. This is something that must start at home. My kids can’t get down from the table until they are done eating, and they have to ask to get down. Remember, it starts at home. I also don’t let my young kids down when we are somewhere like the grocery store. They stay in the cart where I know they are safe and not grabbing things they shouldn’t. Yes, the day comes when they start to walk along behind me, but that was when I knew they are 100% ready for that freedom. You need to have the same expectations and reactions in public as you do at home. If you give in out in public and allow behavior that you wouldn’t allow at home, it won’t take long for your child to put two and two together. They are smart enough to differentiate between different locations. I think one reason my kids are quite good in public is that my discipline methods are the same. I give my Mommy Glare. I take away privileges if needed. I am able to be the same. They know public is not a place where they can get away with things they couldn’t otherwise. At home, our children are expected to sit still, fold their arms, and be quiet for prayers. When they are toddlers and try to get up, I would hold them in our laps. At church, I maintained the same expectation. I would take the child in my lap if they refused to fold their arms as they should. Sometimes the child would start to whine. Most of the time, the child would stop after a moment. There were times when the child would start to then cry. At this point, I might put the child down. I don’t want to disrupt the prayer for everyone else in the congregation while I teach my child. We would then work on it more at home if needed. We could also have consequences applied at home later if behavior was no as it should have been at church. Before you leave your house, make sure your child knows your expectations for the place you are going. If it is the first time you are going to such a place, you will need to take some time to teach what is expected. If you have gone before, you only need reminders. Once you get to the place, before unloading, run through the expectations. For example, when you get to the park, you might say, “Okay kids, where are you allowed to play?” wait for answers. “Correct. Are you allowed to run behind the building over there?” wait for answers. “Very good. When it is time to leave, what do you say to me?” wait for answers. “Perfect. Do you cry and throw a fit?” wait for answers. Doing Ask and Tell just helps set your kids up for success. When your child misbehaves, react to it. Don’t be afraid. I know it can be intimidating to give your child instructions in front of people. If he doesn’t obey, you might be left looking a bit silly. Have confidence in your child and in your work up to this point. Again, this must start at home. I remember when Brayden was about one year old. I remember being at friend’s homes or at the park with several different moms and being faced with the decision of whether or not to instruct him to change what he was doing. If I corrected him and he ignored me, it would be so embarrassing! I chose to correct him. My heart raced a bit as I waited to see his reaction. He listened! I remember being at the park. We had just moved to a new town and Brayden was 13 months old. The play area is not safe for a wobbly toddler and the stairs are really steep, so I instructed Brayden to stay off the stairs. I was about 20 feet from him when he approached the stairs. I called out to him and told him that was a no and he needed to stay off the stairs. The faces of the other mothers were a bit amused at first; here was this first-time mother with her little 13 month old expecting him to listen to her from 20 feet away. Well, he did it, and the faces turned from amazement to shock. We experienced similar reactions with Kaitlyn when she was a young toddler. Even though they had seen it with Brayden, they were shocked to see her do it also. I think they thought I just had a good kid in Brayden, which I do, but he has been taught to be that way. As you correct your children in public, you will come to gain confidence. I came to realize that my heart no longer raced when I asked my children to do something in public. I no longer hesitated in my instructions. I had reached full confidence as a mother and did not fear to instruct my children in public. Your child will not always listen to you in public. Public places are a great place to test a parent’s resolve. There have been times I have ended up carrying a screaming child to the car because they wouldn’t listen to me and we needed to leave. When the moment comes that your child ignores you (WHEN, not IF), respond to it with a consequence. Do not let the child ignore you. This will limit the times they choose to ignore you in public. You will need to tell your child to not do X, but offer what to do also. For example, at church, I say, “We don’t run in the church. We walk.” Just saying “We don’t run” doesn’t tell the child what is appropriate. All that tells him is running is not. It says nothing of skipping, jumping, hopping…what may seem obvious to you is not to your child. Your child does not have the same life experiences that you do. Do not say things that are unkind toward your child. I hope you wouldn’t do this at home, either, but don’t do it in public. Think of how you would feel if your spouse criticized your character in public. I remember one time while shopping a mother said to her child, “You are such a brat!” I felt so sad for him. You can correct your child and instruct proper behavior while still being kind. When your child is behaving appropriately, thank him and tell him what he is doing right. “Thank you for sitting so still. That is such a good boy.” This reinforces his behavior and also gives him a clue as to what it is he is supposed to be doing. When I was pregnant with Brayden, I went to a women’s conference. One of the speakers there was a mother of 8-10 children. They were all closely spaced and she had a few sets of twins. Life must have been hectic for her. But she was the happiest lady. 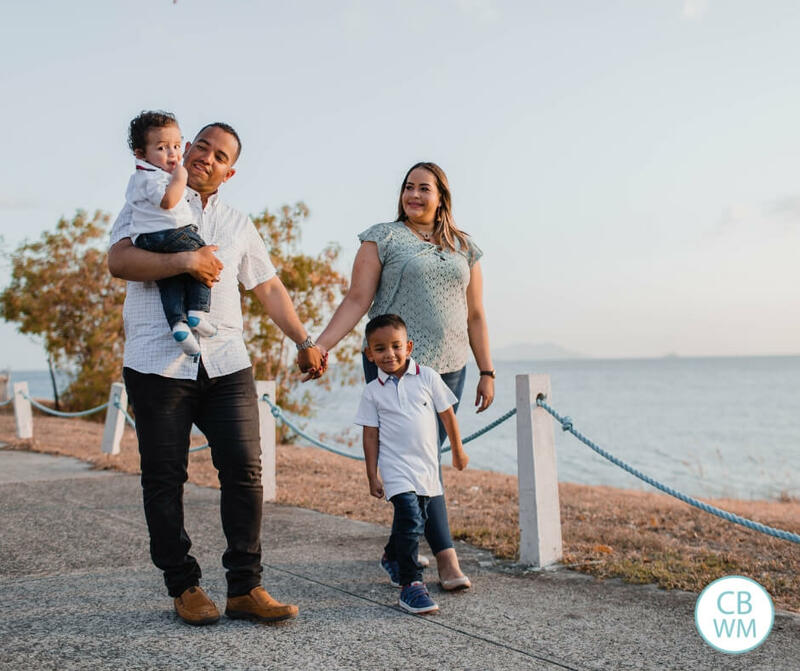 She shared that when her children were young, her husband was serving in the Bishopric, which meant that during church he sat in front of the congregation, leaving her alone with all of her children. I am sure many moms would want to stay home. Others would opt for sitting the back of the congregation where they could not be seen. She decided they would sit in the front of the room. When her children did not behave as they should at church, they had church practice during the week. Each day, they would sit for an hour being quiet and still. I am sure her children quickly learned that they could either be reverent at church for that one day or practice at home for 6, plus church for the 7th. If your child has a hard time with something in public, practice at home. Your child won’t be perfect in public. My children are not always angels. There have been many days we went out and it just doesn’t go well. But most of the time, they are wonderful. I often get strangers come up to me and compliment me on how well-behaved my children are. I remember one Sunday early in my parenting years, I thought my children were being rather rowdy during church. That day, I got several compliments on how great they were. Their behavior was not acceptable for my husband and me, but they still somehow managed to impress people around us. The rough experiences will happen, but overall, going out in public can be something you all enjoy. You do not want to be stuck at home while you have little ones. You can go to restaurants and have an enjoyable meal. I know people who just don’t take their children to sit-down restaurants because it is too stressful for them. You don’t have to be that way. You can enjoy your time together as a family. A little training at home along with proper expectations in public, positive reinforcement when correct choices are made, and consequences when incorrect choices are made can all add up to positive experiences out in public. Great post. Love it! I agree with every single word. Wonderful! Encouraged me so much. Thanks! Great post, very encouraging. I wasn't sure where to ask my question so I thought I'd start here. I'm having a problem with my son who is 16 months throwing things. Toys, sippy cup, pretty much everything. He doesn't do it in a mean way he just..gets tired of holding it or bored with the object and decides to throw it down instead of setting it down. Any tips? I really hate when he does this in public! I have two issues I wanted to run by you. My 15 month old typically does OK in public. One of the things that is starting to become an issue is his desire to always want a snack while we are at the store. Whenever I sit him in the shopping cart he will look back into my purse after maybe 5 minutes in the store and sign more indicating he wants a snack. I always carry them with me because it does keep him busy but now he thinks that grocery cart= snack. He never sees what's inside my purse but he just knows. I'm afraid to not give it to him for fear of a meltdown. Honestly it really doesn't bother me the fact that he has to eat. What bothers me is that I don't have control over that anymore. What if I forgot the snack that day? So how do I deal with this or is it even worth it? I've tried bringing a toy instead but he immediately wants to get a rid of it and get his food! Is this even something worth battling?My second question has to do with what you wrote about Brayden at 13 months in the park. I am amazed that you got him to listen to you on the first try! How do I get my LO to do that? When I first give him the "no" he will ingnore and continue to go to what he wasn't supposed to. I will then walk over to him, move his hand away from it and he will walk away and play with something else without a protest. 15 minutes later he will go back at it, almost as if he forgot, and the process starts all over again. He wont protest (unless he is teething!) but at 15 months he definitely does not listen to my voice the first time. How can I work on this? I know your busy but I just wanted to re-post just in case you didn't get my post above! Thanks!